NETWORK FINALS: WHISTLEBLOWER and the rerun of THE RESIDENT fell 0.1 in final numbers. In addition, probably due to preseason NFL preemptions, the entire CW line-up was down respectively by 0.1/0.1/0.2. CABLE HIGHLIGHTS: A&E’s LIVE PD led Friday cable, up 0.04 to 0.68, with the clip-show lead-in down a tick to 0.29. NFL Network’s NFL PRESEASON games were at 0.41 (Atlanta vs. Giants)/0.37 (Detroit vs. Oakland). Nickelodeon’s noon PAW PATROL was the #4 show on cable at 0.32, and lead-out SUNNY DAY was at 0.22. On HGTV, HOUSE HUNTERS INTL ticked up to 0.32, HOUSE HUNTERS was at 0.31, and TINY PARADISE was at 0.26/0.26, compared to last week’s 0.23/0.22. On HBO, REAL TIME WITH BILL MAHER edged up 0.02 to 0.30, ANIMALS lost 0.01 to 0.03/195K, and RANDOM ACTS OF FLYNESS was down 0.02 to 0.02/123K. 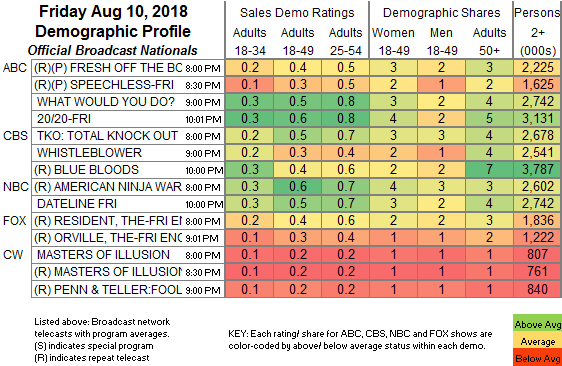 Disney Channel’s latest version of FREAKY FRIDAY was at 0.29, with lead-in ANDI MACK at 0.21. 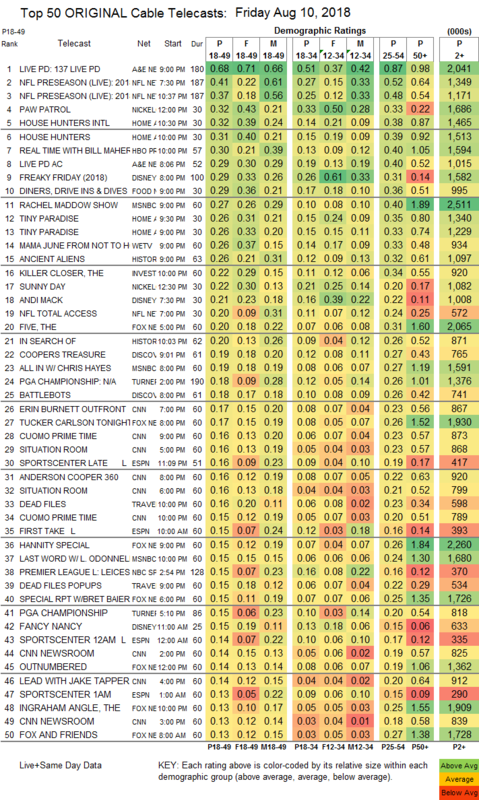 Food Network’s DINERS, DRIVE-INS & DIVES ticked up to 0.29. MSNBC’s RACHEL MADDOW SHOW led cable news at 0.27/0.40/2.5M, with Fox News’s THE FIVE at 0.20/0.31/2.1M, and CNN’s ERIN BURNETT OUTFRONT at 0.17/0.23/900K. We’s MAMA JUNE: FROM NOT TO HOT was steady at 0.26. On History, ANCIENT ALIENS gained 0.02 to 0.26, and IN SEARCH OF was up a tick to 0.20. ID’s KILLER CLOSER was at 0.22. On Discovery, COOPER’S TREASURE rose 0.03 to 0.19, with lead-in BATTLEBOTS up 0.05 to 0.18, and lead-out MAD DOG MADE ticked down to 0.13. On Syfy, WYNONNA EARP climbed 0.03 to 0.13, and KILLJOYS was up 0.02 to 0.07. CInemax’s OUTCAST was steady at 0.02/49K.